The Royal Akarana Yacht Club will today start the 230 nautical mile race the Yates Cup which has been on the calendar since 1967 when it was first won by a yacht name Jupiter. The Yates Cup takes the fleet from Orakei, to Channel Island, Cuvier, Great Barrier, Poor Knights, Sail Rock and then back to Orakei. As a Category 3+ race it’s designed as a training race for larger offshore events such as Round White Island, Three Kings, ANZ Sail Fiji and the Rolex Sydney Hobart Yacht Race. The starting gun will fire at 1000 hours this morning, Friday 21 November, with a 16 strong fleet set to race the course. The fleet ranges in size from 28 to 100 feet. The 100 footer, Rio100, which has just undergone an extensive facelift in Auckland, will today line up for her first race under the ownership of Manouch Moshayedi. The boat, formally Lahana has been training on the Waitemata Harbour over the last few months and is today ready for her first race. “This is the forecast we have all been waiting for and we haven’t had a race like this before. This will be the ultimate challenge for us alongside Rio100 and Giacomo,” said Brady. “It’s interesting that both us and Giacomo have decided to sail with a reduced sail area but this will be testing before making changes in 2015. The forecast is light now so ideally we wish we had of gone with the bigger sails, but it’s also about learning to sail the boats in this configuration. “There will be a lot of tactics out there I’m sure of that. At the end of the day Rio100 is the big unknown for all of us. This is the perfect forecast for them so it should be an interesting race to watch,” continued Brady. Jim Delegat, owner and skipper of the Volvo 70 Giacomo is using the Yates Cup as a final hit out before the Rolex Sydney Hobart Yacht Race. “Our aim for this race is to sail smart and not stray too far from the rhumb line. We will be doing our best to stay in touch with the big boats Beau Geste and Rio100. It’s an exciting prospect as this is our last big race before going to Sydney. We have 14 of our Sydney Hobart crew on board and will be aiming for the overall IRC win for the Yates Cup,” said Delegat. Midnight Express skipped by John Osborne from Wellington recently competed in the PIC Coastal Classic and today see’s Expedition Coppelia as their biggest rival and have their sights set on the short handed champion. “We would be wrapped to beat Expedition Coppelia over the line or on handicap! Preferably both!” said and excited John this morning pre-start. 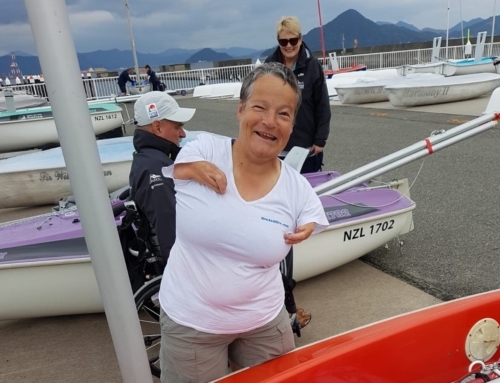 Expedition Coppelia’s crew for the Yates Cup is RAYC Vice Commodore Sally Garrett, who together with owner Rob Croft and Chris Labb are looking forward to the race. 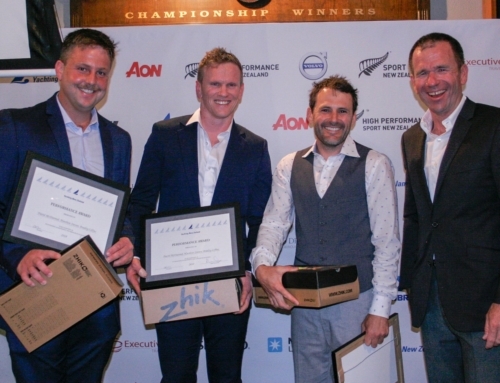 Garrett and Croft have a successful swag of short handed races under their belt winning the Round the White Island in 2012 and the highly competitive Division 3 of the Round North Island Race in February 2014. “We are definitely looking forward to the challenge set by Midnight Express who are looking really polished at the moment,” said Garrett. “This is a really exciting race as we have such awesome and diverse range of boats in the event. I’m pretty happy to see boats like Giacomo, Beau Geste and Rio100 on a start line. I can’t wait!” continued Garrett. Brett Hampson, owner and skipper of the Stewart 24 Promise won this race in 2011. “Sail as fast as you can! Paying attention during the night and not losing the plot is definitely a way to win this race! Me and my little Stewart 34 will be taking a wide berth on Rio100 I think! It’s pretty cool to be on the start line with them,” said Hampson. Andrew Hall and his Unitec ii crew are the smallest boat in the fleet by a counter mile and can’t wait to take on the 100 footers. The 28 footer is keen as mustard to be on the same line with the big boats. “No problem bring it on! It’s going to be be pretty cool being on the same line as Rio100 but honestly we will just try to keep out of their way at the start. It should be a good race for us, but we aren’t looking forward to the 50 mile stretch on the way to Poor Knights as it looks to be the most uncomfortable part of this race for us,” said Hall. “Out ETA on our finish time is… well pass. Who knows, but sometime Sunday and hopefully during the day!” continued Hall. The long multihull in the race is Team Vodafone Sailing who will be racing hard to be the first boat to cross the finish line in at Orakei. They are giving away a TVS pack for anyone who can guess their finishing time and the finish order! The Yates Cup was presented to Royal Akarana Yacht Club in 1967 by Dennis & Philip Yates for a 200 nautical mile ocean race.